This free, printable business plan can assist florists provide flower and gift delivery for special events and holidays in the public and private market. COMPANY NAME provides flower and gift delivery to the [CITY], VA area. Upon receipt of grant funding, the Company will launch a wholesale floral operation in [CITY], [STATE]. COMPANY NAME retail location is in [CITY], [STATE]. The Company offers a large variety of fresh cut flowers, arrangements and gifts. 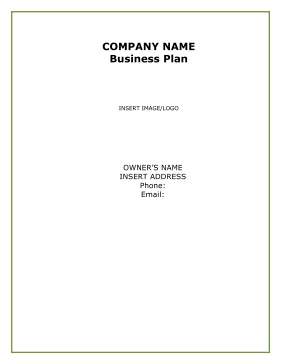 COMPANY NAME is a sole proprietorship owned 100% by INSERT NAME. INSERT NAME has been in the floral business since 1999. COMPANY NAME is committed to quality and service. The Company's 100% Satisfaction Guarantee is our personal commitment to creating long term relationships with our customers. COMPANY NAME will offer a variety of floral products and services including; fresh cut flowers, flower arrangements, flower vases/containers, gifts, delivery and internet ordering. COMPANY NAME retail store is located in [CITY], [STATE]. The wholesale operation will be located in [CITY], [STATE]. The Company will target households and floral shops in [CITY] and [CITY], [STATE] and the surrounding City and County areas. The current financial plan for COMPANY NAME is to obtain grant funding in the amount of $600,000. The grant will be used to launch our wholesale division including leasehold improvements, purchase coolers and display cases, purchase of office furniture, fixtures and equipment, purchase of Company vans and cars, upgrading our website, hiring employees and launching an advertising campaign. COMPANY NAME mission is to provide quality customer services and 100% guarantees on all products and services. To give back to the community by providing needed services and promote quality of life.